Trakai castle is an island in the territory of Lithuania, which offers everything relating to the medieval tradition. 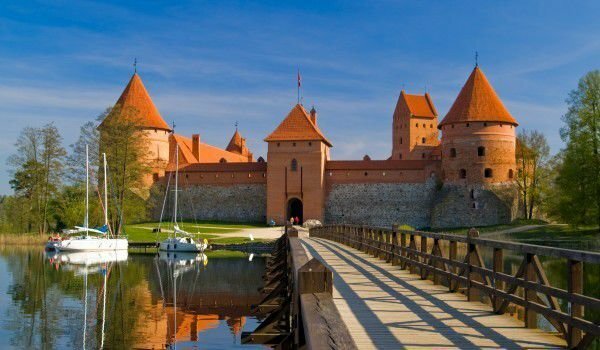 The castle stands beautifully on its own island in the middle of the Lake Galvė and now because of its proximity to the central Lithuanian city of Trakai, it is now a popular tourist destination in the country. Indeed Trakai is the ancient capital of Lithuania. The village is popular locally as the, city of lakes. It is called so, because there are many scenic lakes and hills. The medieval castle is the emblem and symbol of the city and it’s the largest tourist attraction. Today Trakai castle consists of two main buildings - one off the island into the lake and one opposite the shore, which houses interesting museum exhibitions. In the picturesque area of the castle is a third relation to Trakai, but this structure is in default and is not part of the museum complex. The first part of Trakai castle, appeared in lake Galvani in the 14th century, then the building of the second started. The second half of the castle was also built in the 14th century in order of Grand Duke Kęstutis. Construction of the castle was completed at the time of Grand Duke Vytautas and thereafter Trakai castle was becoming a powerful and impregnable fortress. When the capital was moved to Vilnius, Trakai lost its leading role in political life, but retained its importance and leading position as the residence of the Dukes. Trakai still remains an important administrative, political and economic center of Lithuania. Inside the fortress there were regular requests for celebrations and holidays, from guests who attended from across the country and from all corners of Europe. The golden years of Trakai continue until the end of the 16th century, after which then it remains entirely in the shadow of Vilnius. Gradually the shift of the trade routes meant that Trakai began to lose their economic positions. Leading the city to became a place of exile of uncomfortable nobles. They were extradited to the castle Trakai, which was then turned into a political prison.